Every season you spend on a sports team will leave you with more and more memories, and tangible items like sports awards and cup trophies in San Jose and Santa Clara give you something to remind you of your experiences. If you’re planning on giving out sports awards at the end of the season, find a nice sized spot for your event. It’s nice when a coach, parent, or team captain gives a speech to wrap up the season and acknowledge the many accomplishments made, and of course you’ll want to take pictures. Read ahead for some end-of-season event planning tips. Decide what kind of celebration you want to have at the end of the season. A pool party at one of the parents’ houses can be fun for the whole team, but hosting a sports awards ceremony in an auditorium can make the kids feel more grown up. You could also bring the team to a restaurant, a park, or any number of other locations. The key is to consider the size you need. It’s easy to find enough space for a single soccer team, but if you’re throwing one event for the whole league, your options are a bit more limited. For young athletes, each season becomes more competitive as kids develop their motor skills and their understanding of the game. Some teams are comprised of most of the same players each year, while others have a great deal of turnover. Have a coach or referee talk about how the season went, which players showed improvement over previous years, and who has overcome adversity with their commitment to the game. Personalized trophies and customized gifts also make the event more special for the players and parents alike. 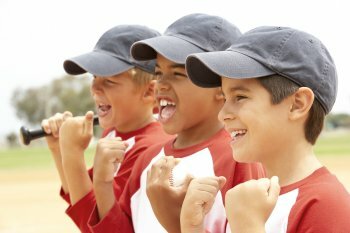 Kids make some of their first friends on sports teams, and they may last a lifetime. Encourage parents to take pictures of their kids and their friends and organize group pictures of the whole team that parents can take and frame.